A Carriage House Wedding takes place at one of the East Coast’s premier wedding destinations. The venue is located in Galloway, New Jersey, but the magnificent estate gives wedding attendees the feeling that they have time traveled to the old elegance and charm of the South. The house is spectacular, with all the allure of a large southern plantation. The big white house faces a large pond that sits directly in front of the building. A large balcony runs the length of the second floor, overlooking the pond and grounds that spread out beyond it. Warm lights shine out of each window of the house and welcome guest as they walk up the driveway. It is a venue that will dazzle all who set eyes upon it. 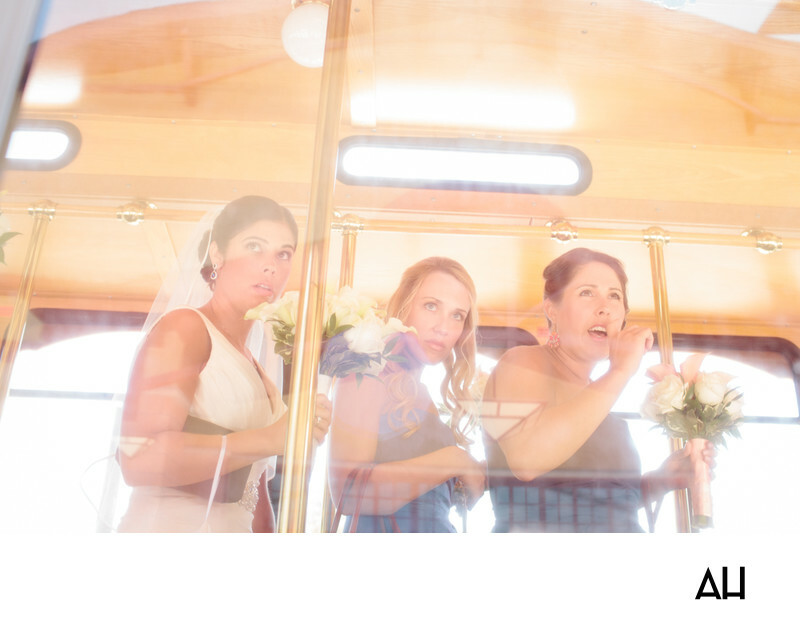 This particular image from a Carriage House Wedding shows the bride and two of her bridesmaids arriving at the venue and preparing to walk out of the party bus. The ladies take in the scene before them, appraising the venue and watching guests arrive to the Carriage House. The girls share varying expressions of wonder and curiosity as they begin to walk down the narrow aisle of the bus. Soon they will descend and join the reception, but for now they are frozen in awe of the moment and in anticipation of the festivities to come. Sunlight bounces off the windows of the vehicle, causing the the bride and her maids to appear lighter and brighter. The windows also reflect the beauty of the venue and add to the filtered image of the girls behind the glass panes. The windows behind the three also add to the brightness of the scene, and as the afternoon sunlight streams in, the bride and her friends are covered by its ethereal glow.